Closest Hotel to Centre of the Dalyan! The 3 star Metin Hotel’s position is one of it’s main attractions, close to the centre of the village yet set back from the main street gives it an excellent location for easy access to all the village amenities. The Hotel garden and pool is fully enclosed by the two hotel room buildings and one with self catering apartments which make up the Metin Hotel. Well kept lawns and numerous trees and bushes, including orange, mandarin, rubber and bougainvillea surround the circular pool and children’s pool creating a very pleasant and relaxing atmosphere. The Metin Hotel is a friendly family run hotel which has been finished to an extremely high standard using local pine, marble and ceramics creating a light and airy environment. 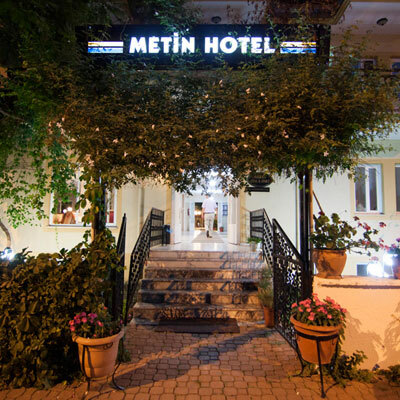 The Metin Hotel is available from April to October and has 25 Standard Rooms, 19 Triple Rooms and 3 Family Rooms. Some of the rooms have views over the rock tombs. There are also 5 self catering apartments which sleep up to 4 people.